People experience stress from work overload, relationship with other people including loved ones, moving, high bills, and other life situations. Cats don't face many of these situations yet it is a mistake to think they never get stressed. • some cats react to a stressful situation in a totally opposite way: they'll try to hide, stalk away, they'll be quiet and otherwise pretend "they are not here". When a cat cannot discern the source of threat or pressure, or when there's no way to avoid it, it can result in chronic stress and anxiety. Signs of chronic stress in cats can be many depending on the individual cat's temperament. The most common ones include decreased grooming, more frequent hiding and fear, excessive vocalization, decreased desire to explore and play, less sleep, appetite changes, elimination in inappropriate places. Please note these signs can also mean an illness. Whenever you are not absolutely sure what causes this or that behaviour, it's recommended that you take your cat to a vet to eliminate possible diseases. What can cause acute stress in cats? Generally speaking, any unexpected threat or changes in the environment such as meeting an unknown cat, a dog, a person, abrupt noises, and so on. Trips to vets and other trips, especially by car, also often cause acute stress in cats. What can cause chronic stress in cats? There are plenty of reasons that can be grouped into three categories: environmental, physical, and emotional. 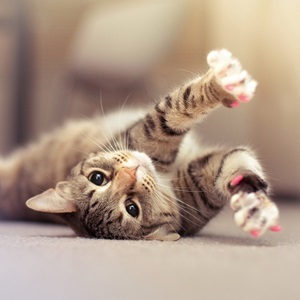 Environmental causes include everything that has to do with the cat's environment such as weird noises of an unknown (for the cat) origin, new baby or new pet in the household, strong scents from air fresheners and house cleaners, radio or television turned on loudly for most of the time, construction noises and so on. Physical causes include an illness, obesity, physical punishment by the owner, fleas and worms, surgeries, etc. Emotional causes include neglect, prolonged absence or loss of the owner or other family members including other pets, prolonged lack of mental stimulation (boredom), frustration when the cat's needs aren't understood and satisfied, fear of people if the cat was previously abused, etc. How to deal with chronic stress in cats? If you have managed to identify the cause of chronic stress, the next step is, obviously, to take it out of your cat's life as long as that is possible. If you haven't managed to identify the cause, or if it is impossible to get rid of it, you can help your cat deal with stress by doing the following. Provide your companion with vertical shelves, boxes, and cat trees so it can hide from threats whenever it wants. Cats need secure places where they can feel safe. Scratching posts are necessary to satisfy a cat's natural need to sharp its claws. If you have several cats, make sure each cat has its own food and water bowl, as well as its own litter box. Interact with your cat often, and give it attention on a daily basis. Games and petting stimulate the production of endorphins, which are commonly known as hormones of happiness that help deal with stress. If you have a kitten, expose it to as many different situations, people, and pets as possible. This is called socialization, and it helps prevent chronic stress in the future. If you're in the process of building a trustful relationship with your cat, go slowly and be patient. When you interact with a fearful cat, go to the floor level as often as you can so you don't look too big and frightening. Don't attempt to stroke the cat when it's not ready to be stroked (you can tell that if the cat tries to avoid your hand). Let the cat get used to you at its own pace, wait patiently until it comes to smell you or your hand first. Keep your hand on the floor with your palm up - this is how you're showing that your hand isn't a threat. Don't rush the process, and little by little your cat will learn to trust you.